Citroën has given an insight into the forthcoming C5 Aircross SUV Hybrid with a preview of the concept model that will debut at the Paris Motor Show. Due for launch at the start of 2020, the hybrid will join the petrol and diesel models revealed this summer and marks the brand’s first-plug in hybrid. 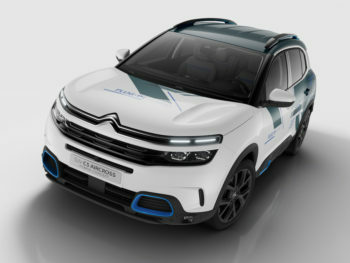 It’s also the first model under Citroën’s ‘Low Emission Vehicle’ (LEV) offensive, which will see it launch one new LEV range each year from 2020, in line with the target of having an all-electric range by 2025. Shown with a blue livery and styling to mark out its PHEV credentials, the C5 Aircross SUV Hybrid Concept combines a 180hp PureTech S&S petrol engine with an 80kW electric motor and an e-EAT8 automatic gearbox. Total power stands at 225hp and the PHEV offers a claimed electric-only range of up to 50km at speeds up 135kph. Drivers can switch between electric, hybrid or Sport modes using the mode selector on the central console. Official NEDC fuel consumption stands at 2l/100km with sub-50g/km CO2 – down 40% compared to the combustion model – helped by the i-booster electric-assistance braking system, which recovers the energy available during braking and deceleration. The battery is located under the passenger compartment, ensuring the PHEV retains the boot space of the combustion engine versions, and can be charged in between four and eight hours with a standard socket while a 32A wall box provides a claimed two-hour charge time. Drivers can also access charging data via the MyCitroën app, which includes functionality to programme a re-charge, start or stop the charge at any time and view the battery’s charge level.